A wonderfully refreshing, cleansing broth – one that we usually make on a Monday evening, after making stock from our leftover roast on Sunday. We can’t bare reading about goodie two shoes who do things like that, but we really try to make ourselves get on and do it – just popping the bones along with onion, garlic, bay leaves and anything else you have lying around – we don’t bother to peel anything, just roughly chop, cover with water and bring to the simmer for an hour or two. It gives you that I am going to have a really healthy week smug feeling – starting Monday afresh after perhaps a rather indulgent weekend. Of course if you haven’t made your one then just use store bought vegetable or chicken stock, or water is fine too. The broth will still work if you don’t have all the ingredients listed, so don’t feel that you have to go out and buy everything, you are just wanting to create flavour to the liquid so feel free to experiment. We learnt about the cut feather blade (which is what the Flat Iron comes from) recently from an assistant of ours – Felix who was our chief BBQ chef on a pop up we did at the beginning of the summer. Its fantastic! Its cheap and delicious, it comes from the shoulder and is not a well known cut, mainly because it is a bit of a pain to prepare. Luckily for us Felix was an expert in preparing the feather blade – it comes with gristle down both sides, once butchered you are left with flatiron steaks – beautifully tender and ideal for whacking on the BBQ or grilling. If you are up for it purchase the whole feather blade and have a go yourself, use the off cuts for a stew. It is fun and so rewarding learning a new technique. If you can’t find flat iron then you could use any other steak for this, sirloin or fillet would be delicious. Equally you don’t have to serve it with steak at all – perhaps just some plump prawns, or keep it veggie and add some kale or bok choy. 1. Heat a little nut oil (or oil of your choice) in a pan and add the shallot, garlic, ginger, lemongrass, and chilli and sauté for a couple of minutes. Add the cinnamon stick, star anise, coriander stems, lime leaves and stir, add the fish sauce, white wine and stock. Simmer for about 20 minutes, taste. Take off the heat and drain into a bowl – discard the veggies, pour the liquid back into the pan add the mint leaves, honey, soy, lime zest and juice, taste and season. 2. Cook the steak – either light up the BBQ or heat a heavy based pan on a high heat. Rub the steak with olive oil, salt and pepper and cook over a high heat turning the steak only once after a rich, golden crust has formed, reduce heat to medium when the crust has formed. Cook 4 to 5 minutes on each side. Leave to rest for at least 5 minutes then thinly slice. 3. 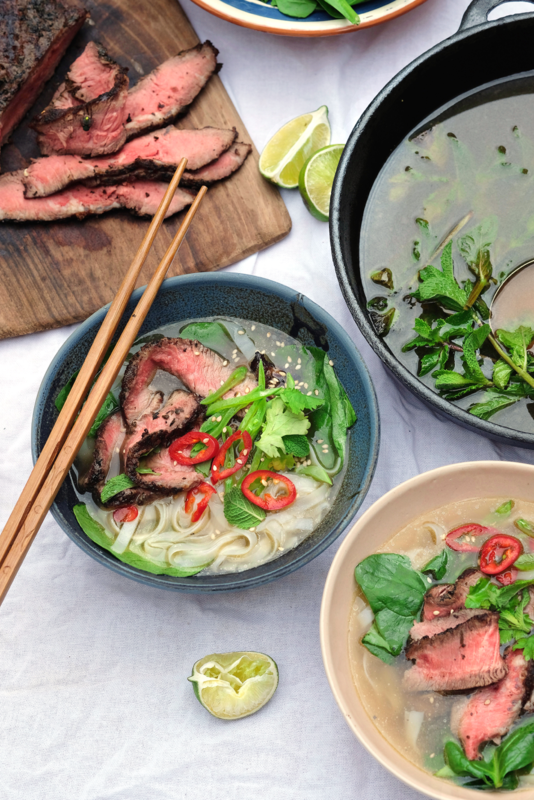 To serve place some noodles in the bottom of each bowl, pour over the broth and add spinach if using, top with the sliced beef, sesame seeds, coriander leaves and sliced chili.